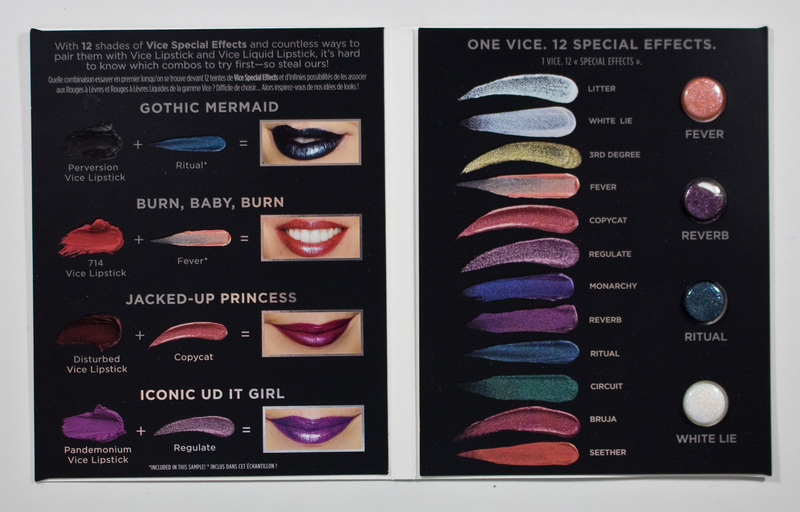 Urban Decay Vice Special Effects Long-Lasting Water-Resistant Lip Topcoat in White Lies, Fever, Seether, 3rd Degree, Reverb & Ritual. The Urban Decay Vice Special Effects Long-Lasting Water-Resistant Lip TopCoat retails for $20US and $24CAN for 0.16 oz/ 4.7 mL of product. Urban Decay Vice Special Effects Long-Lasting Water-Resistant Lip Topcoat in White Lies, Fever, Seether, & 3rd Degree. Urban Decay Vice Special Effects Long-Lasting Water-Resistant Lip Topcoat, Box art. 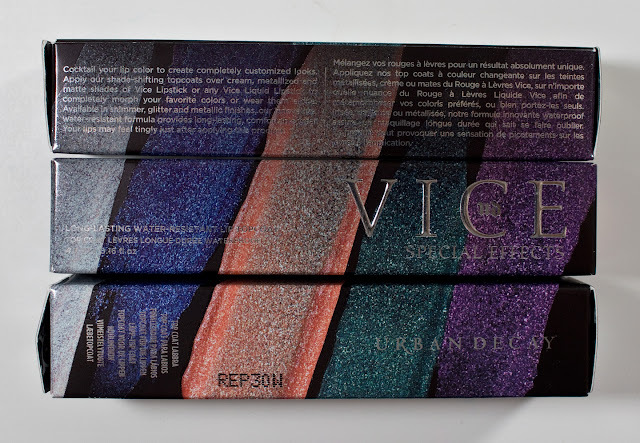 Urban Decay Vice Special Effects Long-Lasting Water-Resistant Lip Topcoat in White Lies, Seether, & 3rd Degree, Box art. Urban Decay Vice Special Effects Long-Lasting Water-Resistant Lip Topcoat in White Lies, Seether, & 3rd Degree, Box art labels. Urban Decay Vice Special Effects Long-Lasting Water-Resistant Lip Topcoat in Fever, Reverb, Ritual, & White Lie, sample art. 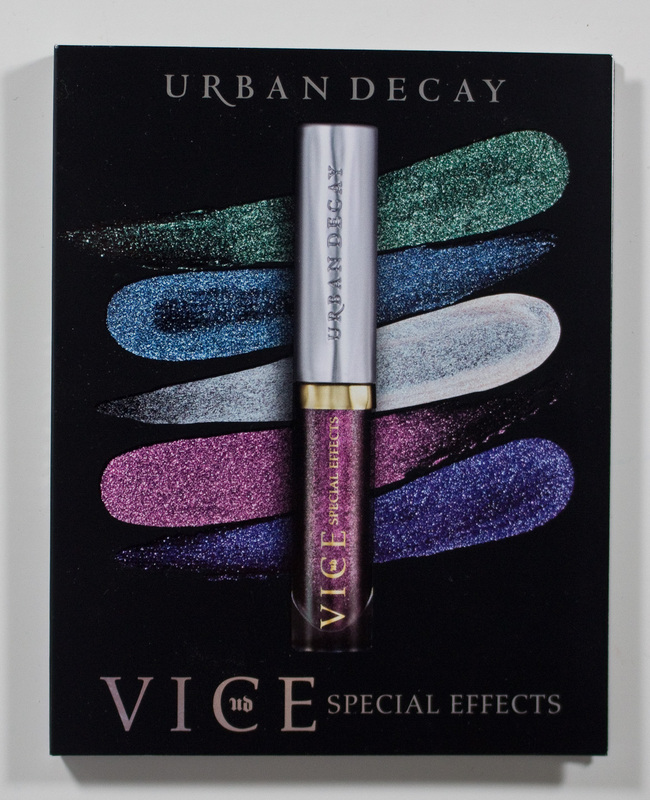 Urban Decay Vice Special Effects Long-Lasting Water-Resistant Lip Topcoat in White Lie & Fever. Water, Calcium Sodium Borosilicate, Acrylates/Ethylhexyl Acrylate Copolymer, Glycerin, Polyethylene Terephthalate, Calcium Aluminum Borosilicate, Sodium Polyacrylate Starch, Pentaerythrityl Tetraisostearate, Phenoxyethanol, Silica, Acrylates Copolymer, PVP, Tocopheryl Acetate, Caprylyl Glycol, Aminomethyl Propanol, Potassium Sorbate, Disodium Lauriminodipropionate Tocopheryl Phosphates, Disodium EDTA, Laureth-21, Hexylene Glycol, Tin Oxide, Tocopherol, Silica Dimethyl Silylate, Butylene Glycol, Pentylene Glycol, Tetrahexyldecyl Ascorbate, Sodium Chondroitin Sulfate, Atelocollagen, Benzoic Acid, Dehydroacetic Acid, Synthetic Fluorphlogopite, Capsicum Frutescens Fruit Extract, Polymethyl Methacrylate, Polybutylene Terephthalate, Polylactic Acid. [+/- (May Contain): CI 77891 / Titanium Dioxide, CI 77491, CI 77499 / Iron Oxides, Mica, CI 75470 / Carmine]. 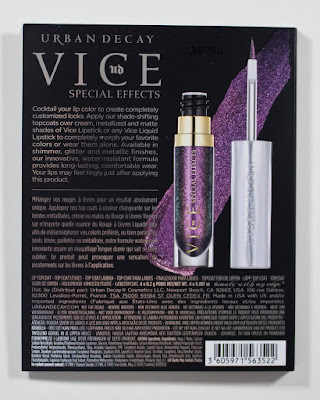 The Urban Decay Vice Special Effects Long-Lasting Water-Resistant Lip TopCoat formula is VERY thin in texture, it reminds me of the watery feel of a lip topper but is slightly more alcohol thin. It goes on smoothly and easy to even the shade out before it dries down with excepting of the dark shades Reverb & Ritual. 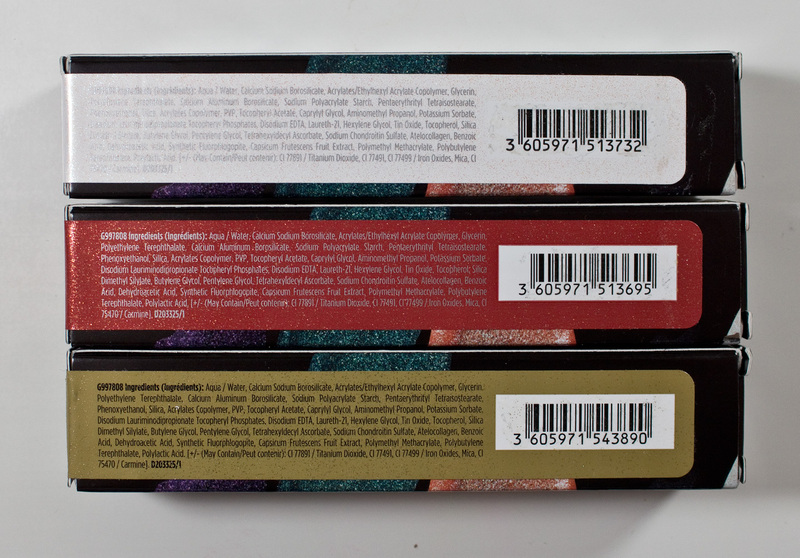 The one thing I have to hand it to the formula, all the shades use fine milled Shimmer/Glitter particles to create the metallic effect for the colours. 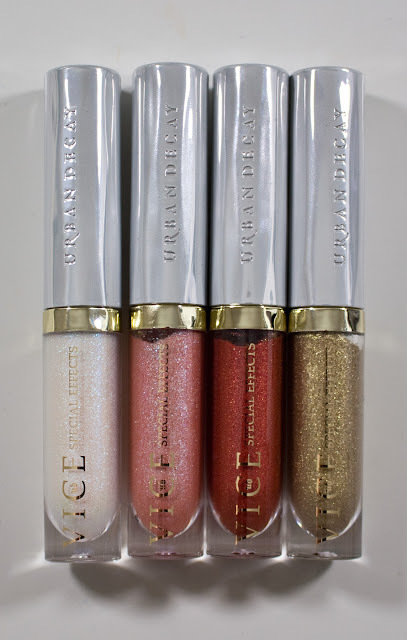 Thes don't feel gritty while wearing them like other glitters that are used in lip toppers and glitter lipstick kits. The scent smells faintly of alcohol that dissipates quickly and I found these easy to remove with Micellar Water or just water if you soak your lips with a towel. 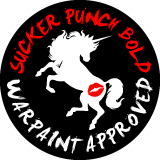 White Lie is an iridescent white with blue-green shift shimmer. Fever is a sheer peach base with blue-violet shift shimmer. Seether is a warm red with a gold micro metallic shimmer finish. 3rd Degree is an aged gold with a metallic shimmer finish. Reverb is a sheer black base with pink-violet shift shimmer. Ritual is a sheer black base with blue-green shift shimmer. 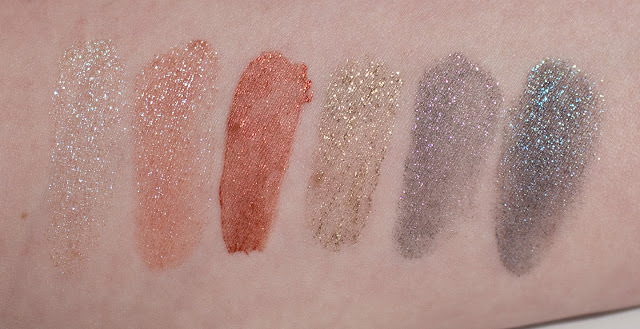 Wear: I get about 5-6 hours for the shimmer. Packaging: Is clear plastic tube with a brush applicator. Daylight swatches: White Lies, Fever, Seether, 3rd Degree, Reverb & Ritual. 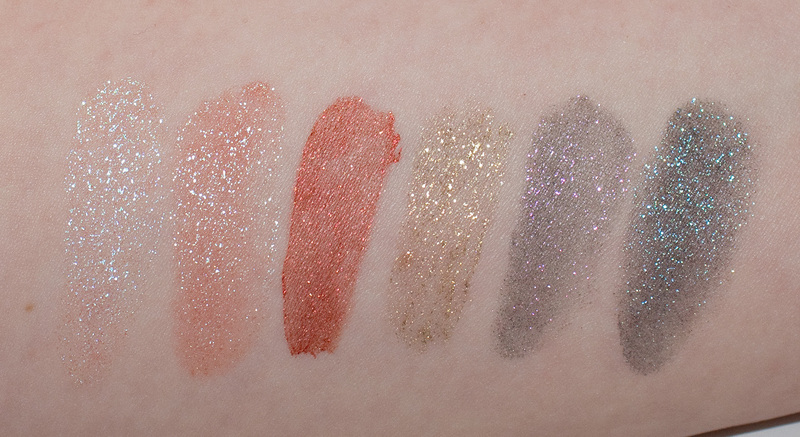 Flash swatches: White Lies, Fever, Seether, 3rd Degree, Reverb & Ritual. These are nice lip topper shades for over other shades of lipstick of liquid lipsticks. 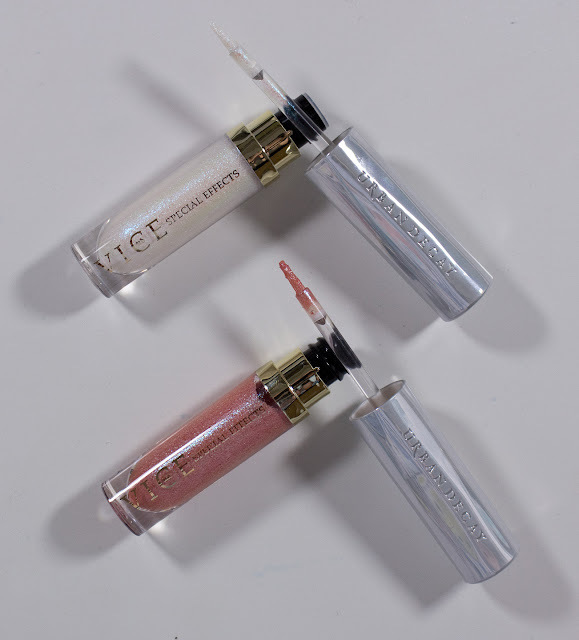 You don't need a lot of these shades however as a number of shades share the same shimmer which is the most important aspect of this product line to give you lip light. They are seeming to be phasing these out as I got them are Winners/Marshalls here in Canada for $16. I don't particularly like the black base in the shades Reverb and Ritual as it not needed over dark lipstick shades can make you like look uneven because of the black.